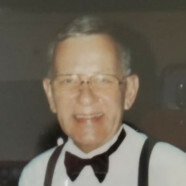 Saturday, February 9, 2019 10:00 a.m.-1:00 p.m.
Gene Hadley Brinkman, 82, passed away peacefully on January 31, 2019 at his residence in Clermont, Florida. Mr. Brinkman was born in Okawville, Illinois on January 4, 1937 to the late Grover and Leona Brinkman. He married Lily Sue Bopp of Trenton, Illinois on June 7, 1958. He was a graduate of Okawville High School, and attended McKendree College in Lebanon, Illinois and received his Bachelor’s Degree from Culver-Stockton College in Canton, Missouri. Mr. Brinkman was in the insurance business for over 40 years and was a United States Marine Corps Veteran. In his free time, he enjoyed restoring vintage sports cars and golfing. His wife Lily Sue Brinkman, and his parents Grover and Leona Brinkman preceded him in death. Surviving are his two sons, Steven (Dawn) Brinkman of Orlando, Florida, Jeffrey (Julie) Brinkman of Pisgah Forest, North Carolina; Grandchildren, Madison, Ashley and Grant Brinkman, Erich and Michael Brinkman; sister, Shirley Kocher of Columbia, Illinois, sisters-in-law and brother-in-law, Betty Martin and Margie and Carl Bopp of Trenton, IL, and nieces and nephews. Funeral Service will be Saturday, February 9, 2019 at 1:00p.m. at Moss Funeral Home in Trenton. Visitation will be Saturday, February 9, 2019 from 10:00 a.m.-1:00 p.m. at Moss Funeral Home in Trenton. Burial will be in Trenton Cemetery, Trenton, Illinois. In lieu of flowers, donations may be made to the Scleroderma Foundation.